The African country of Botswana is attractive enough for those who are planning to invest in the telecommunications business sector. It is great for creating a profitable GSM termination startup. The demand for call termination business proposal here is quite high here. Due to the fact that the country is the biggest producer and exporter of diamonds, as well as through the annual influx of tourists (income from foreigners visit Botswana is about $500 million a year), a lot of international traffic is handled here. With low pricing on local cellular communication and the average value of voip $0.17 per minute, it is possible to obtain a high return on landing calls. 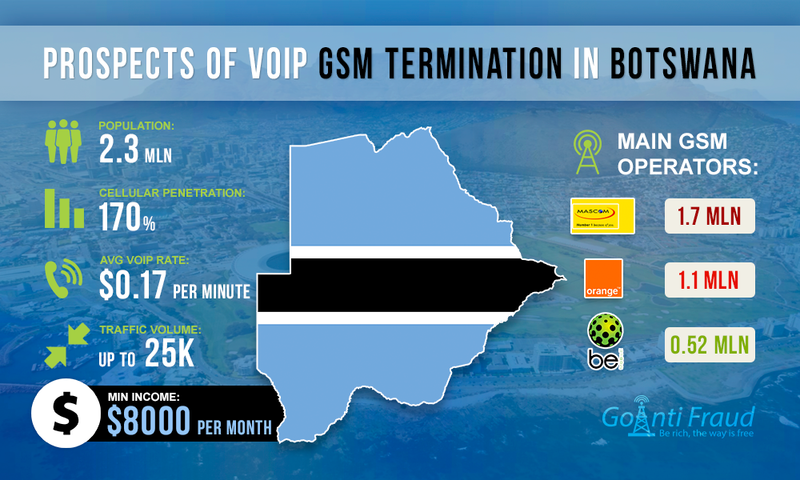 The monthly volume of traffic for termination, according to the call termination business proposal Botswana, is 10-25 thousand minutes. As of 2016, the country's population is more than 2.3 million people. The level of mobile coverage in Botswana is about 170%. The largest GSM operator is Mascom, whose subscriber base totals 1.7 million people. Orange company takes second place in the market coverage (1.1 million users). The third biggest operator is BeMobile. Its subscriber base is about 0.52 million people. In Botswana, you can select prepaid packages to make local calls at $0.057 per minute. Operating 4 hours a day using a 16-channel gsm gateway sip, you can make a profit of about 8.5 thousand dollars terminating VoIP. You can run your business in Botswana smoothly and get significant monthly income if you reliably protect your SIM-cards from the fast lock by Antifraud systems. We suggest connecting your VoIP gateways and SIM banks to GoAntiFraud and use proven tools to simulate human behavior. They will help to minimize the number of locked numbers. The convenient software will automate workflows and thereby save the terminator’s time.